Check out Mennonite Church Canada Common Word for resources on this important topic: http://www.commonword.ca/Browse/2183. Check out Menno Media’s – Shaping Families a 15-minute online weekly radio program. www.ShapingFamilies.com . 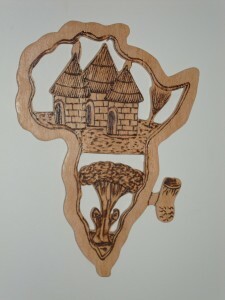 Handcrafted map of Africa is from Burkina Faso. February 2011, Kenneth participated in a Mennonite Church Canada Learning Tour to Burkina Faso. It was an opportunity to experience the life and witness of a developing Church community which is supported by MC Canada. Kenneth was intrigued with the workmanship that went in to producing something as intricate as the map–only an outline but with some features added suitable to African life. As a former geography teacher anything related to a map appealed to him and he made the purchase. The map is a tangible way for us to be mindful of our African brothers and sisters. 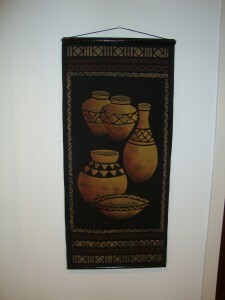 The wall hanging is from Zimbabwe. In 2003, Dana was a part of the MCEC group who participated in Mennonite world conference gathering in Bulawayo, Zimbabwe. The hanging was given to the church by Dana as she shared of her experiences in worship and said thank you to the church for their financial and prayerful support. Statue is from Lithuania where Mary Anne was on a study abroad term (2001-2002) through Canadian Mennonite University and again with the Eastern Mennonite Missions YES program in 2003-2005. 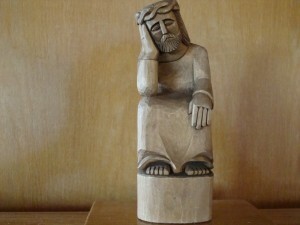 The “crying Jesus” figure is unique to Lithuanian (Catholic Church) culture because of the hardships the country has gone through. Jesus understands and is weeping with them. Mary Anne thought this was an appropriate representation of Lithuania and something interesting to share with the church. Banner was created for the service of ordination for Matthew and Hendrike Isert Bender on Sunday September 26, 2004. The words are taken from Isaiah 43:1. 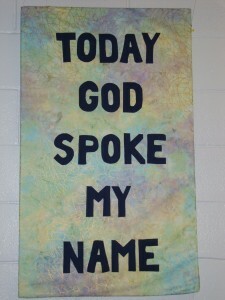 God loves us, gifts us and calls each of us by name, to follow and to love others as God has loved us. The banners were digitally created by Chris Cressman to hang in the front of the sanctuary when there is no other banners being used relating to a specific theme. They were hung for the first time September 2007. 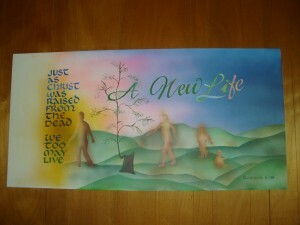 The idea for the banners emerged from a church retreat on February 23-25, 2007 entitled Approaching God’s Feast. 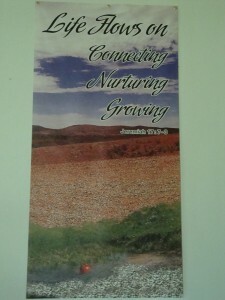 The retreat was guided by two scriptures Jeremiah 17:7-8 and Psalm 63:1-5a from which the banner themes emerged. 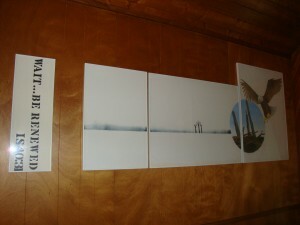 This wall hanging was created as a way to process the terrifying experience of 9/11. It is a statement of hope and confidence in the way of Peace over the way of violence. 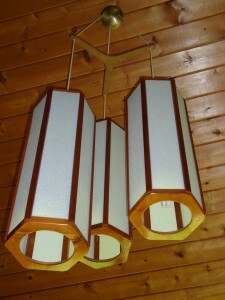 During Willard and Beulah’s time as church custodians, Willard shared his creative talents with the church by making the clock and light fixtures which hang in the sanctuary. 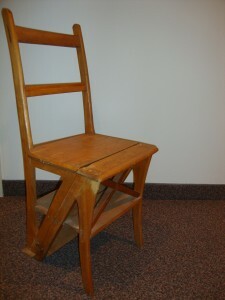 They continue to serve a functional purpose but also add beauty and personal touch to the Nith Valley worship space. 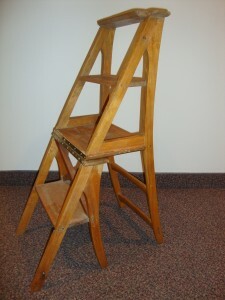 Zenas Snyder made this simple multi-purpose chair/step ladder. 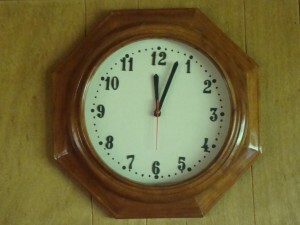 It sat in the original Biehn church under the clock recalls his daughter Beulah Cressman. This century old item is a concrete physical connection to people and memories of the past which presently sits at the back of the Nith Valley Sanctuary. 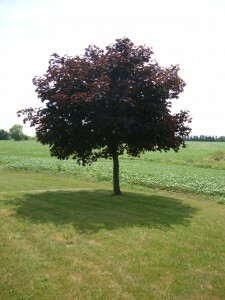 On the occasion of the Mennonite bicentennial and in Honor of the ‘Mothers of Nith Valley”, the ‘Crimson King’ maple tree that is now located on the south-east corner of the church property was given to Nith Valley by Stephen Hoke. As this tree grows through the changing of the seasons, year after year, it continues to witness to the enduring faith and presence of Mennonites in Canada and the strength of a mother’s love for her children. 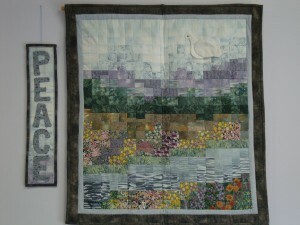 This piece was commissioned by the sewing circle with funds donated by Gladys Cressman in memory of her husband Clayton. This work is based on the words of the Apostle Paul in Romans 6:4b. New life is depicted in the new tree growing from the old stump and in the life of the infant, through youth and maturity to older adulthood. The dark sky of early life may represent the concerns and uncertainties of human life, giving way to the subdued light of faith and trust in God and finally to brilliant light as eternal life is anticipated. ‘Wait … be renewed’ takes its title from Isaiah 40:29-31. This passage refers to the renewal of strength that comes from the Lord. 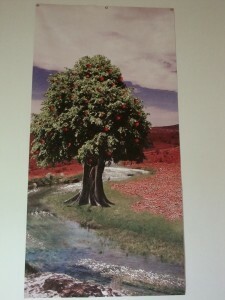 For Christians, the three trees represent the new life that has come because of Golgotha. The eagle tends its young in the nest with strength and vigor and thus gives strength to its young. So, we too, are given strength and sustenance in the living Christ.